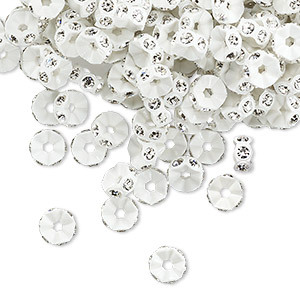 Bead, Swarovski® crystals and plastic, crystal clear and transparent clear, 5x2.5mm mini rondelle. Sold per pkg of 12. Item Number: H20-7488PB Have a question about this item? 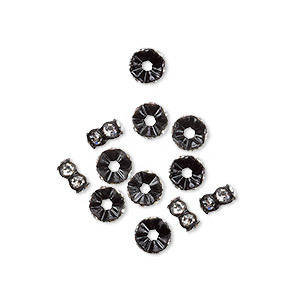 Sparkling Swarovski crystal foil back chatons are set in plastic, surrounding the center hole of this mini rondelle bead. 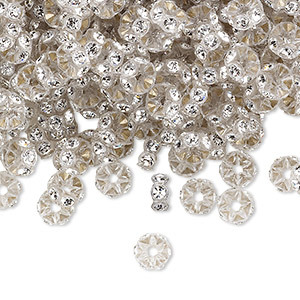 Lightweight beads enhance designs without adding a metal color or shine. Safe for most wearers with allergies or sensitivities. 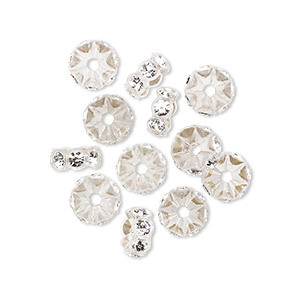 Bead, Swarovski® crystals and plastic, crystal clear and transparent clear, 5x2.5mm mini rondelle. Sold per pkg of 144 (1 gross). 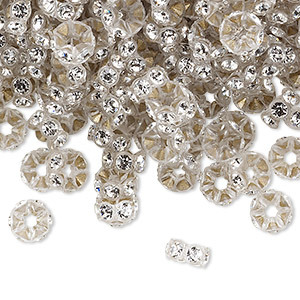 Bead, Swarovski® crystals and plastic, crystal clear and transparent clear, 5x2.5mm mini rondelle. Sold per pkg of 1,440 (10 gross). 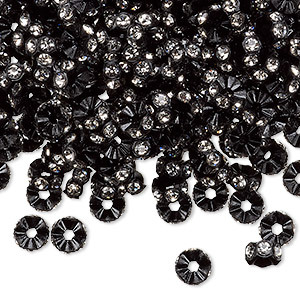 Bead, Swarovski® crystals and plastic, crystal clear and transparent clear, 7x3mm mini rondelle. Sold per pkg of 12.